Teachers are always looking for new, innovative ways to teach their students poetry in the classroom. 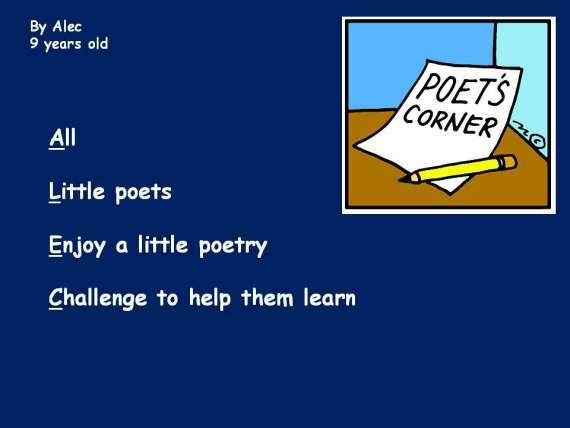 Acrostic Poetry for Kids is a resource tool developed by My Word Wizard that teachers can incorporate into their lesson plan to teach poetry to kids. 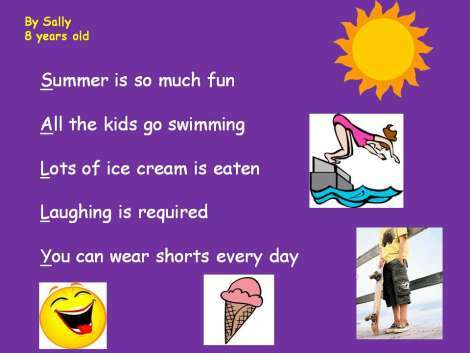 An acrostic poem is a beginner's level poem great for budding young poets. In this type of poem the first letter of each line spells out a word. The poem may be a series of single words as in the example below, or may be a series of sentences or phrases. TASK: Have your students write their own Acrostic Poem using their name and/or surname. Ask them to include visual images to illustrate each of the words included in the poem! Are you an educator teaching poetry to your students? Our editors are always looking for new poems to add to our collection. Submit your student-written Acrostic Poetry for Kids to our editors by emailing them to us here.